> Dell Software > When did our API become so important? Ecommerce continues to grow at an exponential rate. Current predictions have US online shoppers spending $262 billion in 2013 alone. With this much money at stake, organizations are looking for ways to optimize their ecommerce processes, expand their online business and drive revenues. 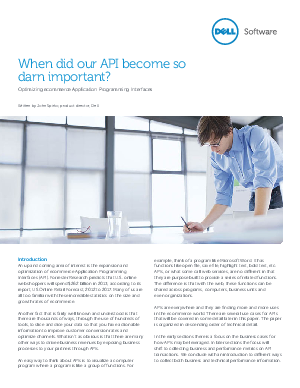 Download Dell Software’s white paper When Did our API Become So Darn Important? and see how expanded API usage can help grow your business.